Carnegie Knox is delighted to announce that they have chosen Sue Ryder as their 2018 Charity of the Year. The Charity, home to Scotland’s only purpose-built specialist neurological care centre, provides person-centered hospice and care for those facing a frightening, life-changing diagnosis. Not only do they treat more conditions than any other UK charity in their hospices, neurological care centres and out in the community; but they also influence others to improve the lives of people living with such illnesses. 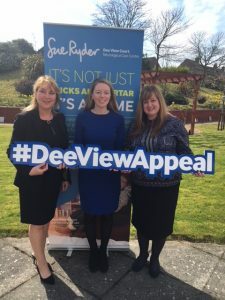 With demand for a place at the Dee View Court facility continuing to grow, the Charity is currently campaigning to raise £3.9 million to build new specially adapted rooms and apartments to accommodate the increasing need for their specialist services across the country. “We currently provide facilities for up to 24 residents at any one time. Following the expansion we will be able to offer room for up to 43 people in total – nearly double,” she added.